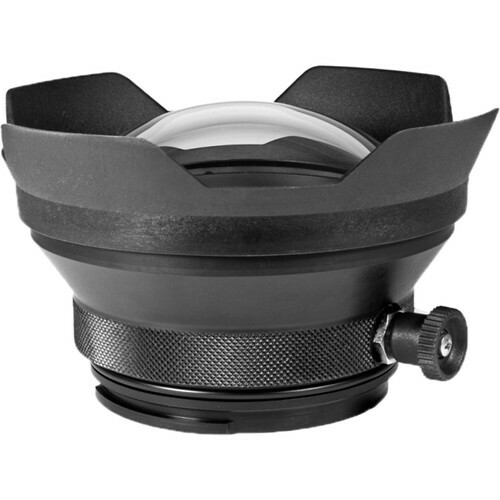 Capture images of coral, whales, and shipwrecks at depths as great as 197' with this Nimar 5" Dome Port, which is dedicated to the Olympus M.Zuiko Digital ED 9-18mm f/4.0-5.6 Lens. It's compatible with mirrorless camera housings from Nimar. A zoom knob on the side enables easy focal length adjustments as you compose your shots. The port's dome shape corrects for the underwater size distortion that makes everything appear 25% larger and closer, thereby helping to restore the original wide angle of view of the lens. Additionally, the petal shape of the built-in hood blocks excess light to prevent lens flare, providing just the right amount of shade without causing any vignetting. As the edges protrude slightly beyond the dome, they also offer some protection against impact. A front element made of hardened crystal glass provides excellent clarity, while the black Delrin body resists corrosion by seawater.